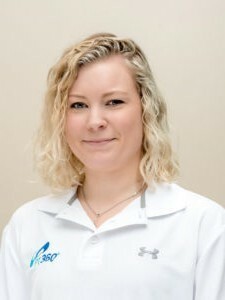 Emma works as part of the PT360 team as a Certified Athletic Trainer, who received her Bachelors of Science in Athletic Training from the University of Vermont in 2013. During her time at UVM, she interned in multiple sports medicine settings, including with the UVM Women’s Basketball and Ice Hockey teams, Burlington High School, and with multiple sports at Saint Michael’s College. Following graduation, she spent a year assisting a Sports Medicine doctor at the University Of Vermont Medical Center. As a clinician, Emma spends time working as an ATC at local Vermont high schools. She is passionate about safety in youth sports, concussion management and education, and the importance of not only rehabilitating athletic and orthopedic injuries, but educating her patients and athletes on the prevention of these conditions as well. When not at work, Emma enjoys spending time with her family and friends, especially her husband and their overly-clumsy Great Dane.